We have taken MH Magazine to the next level! Some of you possibly remember the first version of MH Magazine. The first release of the theme already was very flexible and it was one of the first themes that provided a fully widgetized template with tons of widget areas for great flexibility. 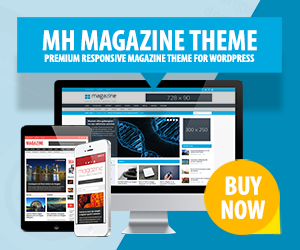 Now, almost 2.5 years later, the MH Magazine WordPress Theme is with over 390,000 downloads one of the most popular magazine themes for WordPress and it was the most popular WordPress theme in general on Creative Market in 2014. The great success of MH Magazine would not have been possible without the helpful feedback and awesome support we have received from our loyal customers in more than 110 countries around the world. Now it's time to give something back! We've spent weeks of planning, coding and testing the new version of MH Magazine and we've included awesome new stuff, especially many things based on your valuable feedback that constantly makes this theme better and better. MH Magazine WordPress Theme v3.0.0 finally has an additional widget area in the header and an increased width. In addition we've added several new widgets to provide even more flexibility to create professional magazine and news websites. Also the theme options have been restructured and we've removed some redundant options that in our opinion don't make sense anymore and we've added new awesome stuff like for example an option to switch the layout from boxed to wide. You can view the changelog for MH Magazine WordPress Theme to see the full list of changes. To show what is possible with the new version of the theme we've also created three brand-new demos for your inspiration and in addition the theme documentation has been written from scratch and extended to provide a better user experience while installing and configuring this popular magazine theme for WordPress. MH Magazine WordPress Theme v3.0.0 is not a regular update as we basically have recoded and improved almost any aspect of the theme to improve the theme and to make it ready for future development and awesome new features. These major changes also mean that the new version can't be installed as a regular update and it's not recommended to update the theme by just replacing the theme files via FTP as that could lead to several incompatibilities. Instead please install the new version of the theme through your WordPress dashboard like you would do with any regular new theme and then configure your site as you prefer. You can find instructions regarding the installation and configuration of MH Magazine in the theme documentation. We've also changed the name of the theme folder and that means you can install the new version alongside the previous version and easily switch between new and old version to ensure a smooth transition. If you had created a custom child theme for the previous version of the theme, that child theme won't be compatible with the new version of MH Magazine. That means if you want to keep using your custom child theme, you would need to modify the child theme to make it compatible with the latest version of the theme or create a new child theme from scratch. This by far is the best and most flexible magazine theme we've released so far and we're sure you'll like the countless improvements we've added to the theme, not only under the hood, but also regarding layout and design. As always we've spent days for testing to ensure a bug-free and reliable experience for our loyal customers. We thank you all for your support over the years and the ongoing feedback that helped us to create and constantly improve the MH Magazine theme to where it is today – one of the most popular and reliable magazine themes for WordPress.